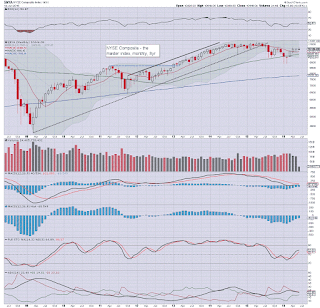 US equities broke a new multi-month high of sp'2120.55, with the Dow back above the 18K threshold. Yet the market has started to cool again, and if multiple aspects of support in the sp'2030/20 zone don't hold, things are about to get wildly bearish. 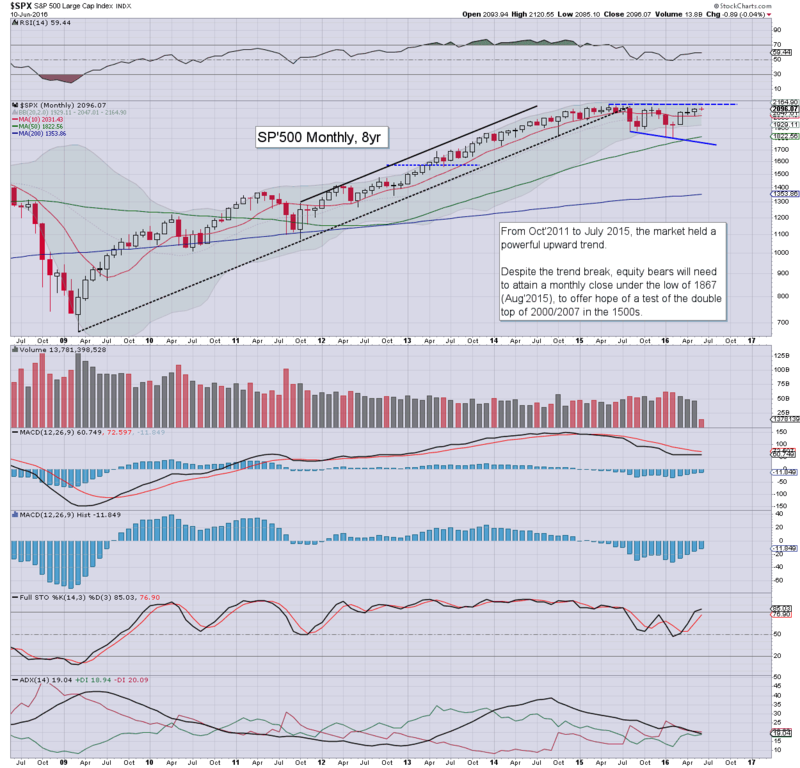 With the Friday decline of -19pts (0.9%), the sp'500 is back to flat for June. Upper monthly bollinger is offering the 2160s, but equity bulls will have to first break a new historic high >2134, and based on the past 12 months of price action, that looks extremely difficult. Underlying MACD (blue bar histogram) continues to tick higher, currently at -11.8. Clearly, if the bulls can close June on a positive note - in the 2100s or higher, we'll see a bullish cross in July/August. However, another failure to keep pushing higher - as seems probable, will result in another severe down wave, at least to the low 1900s. Based on price structure, and the 'reality' of the world economy, a decline to the sp'1600s remains a realistic target, before the central banks intervene. Best guess: increased cooling across June, at least to the 2030/20s. 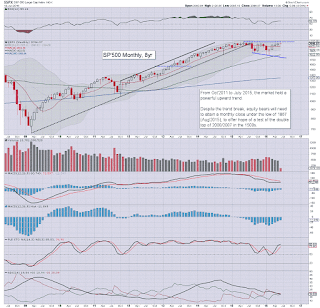 If broken, then 1950/20 before end month. If held, then renewed upside... to new historic highs. The Nasdaq has repeatedly come very close to re-taking the giant psy' level of 5K, but keeps failing. 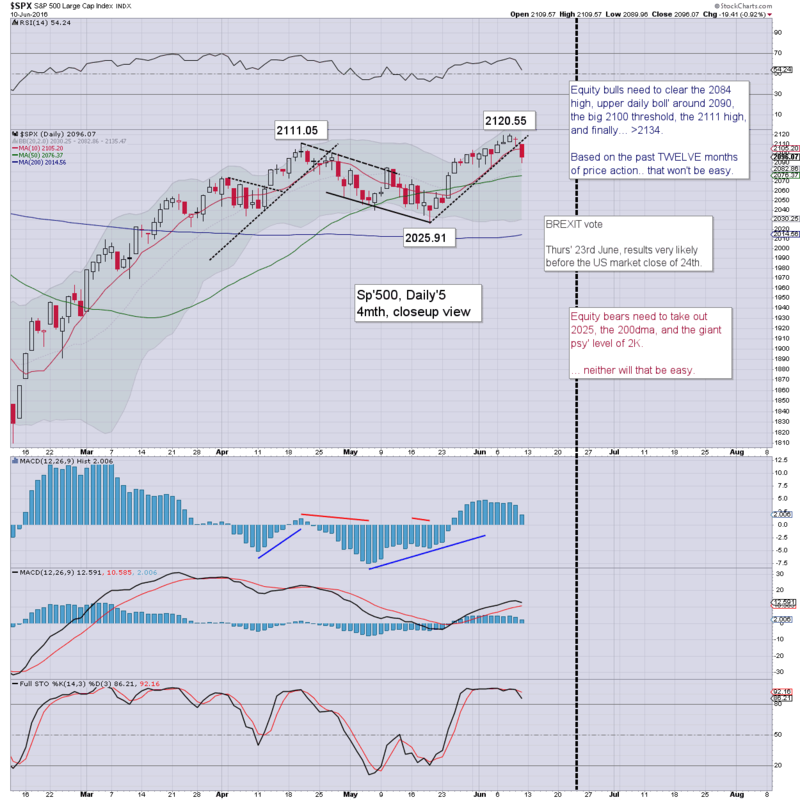 A break back under the key 10MA (4844) would be a bearish sign, and open the door to the lower monthly bollinger in the 4500s. 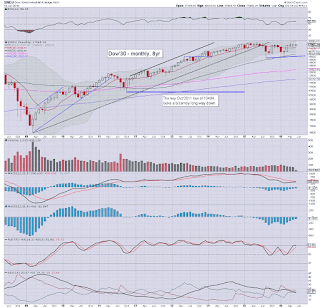 If the June close is significantly weak, then the 3200/3000 zone is a viable target. 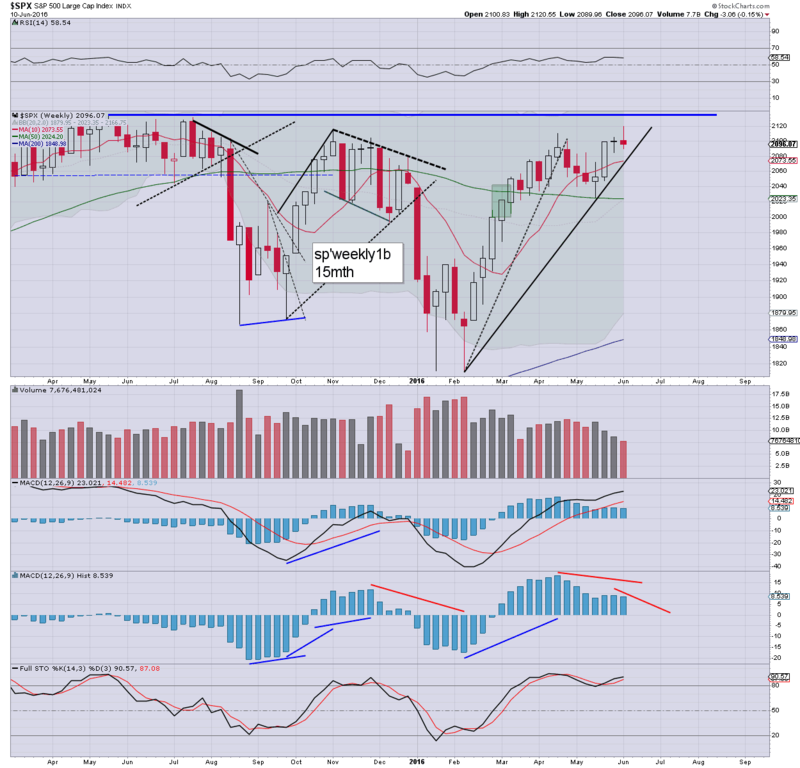 The mighty Dow saw a Wed' close of 18005, but the week ended on a moderately negative note, settling @ 17865. 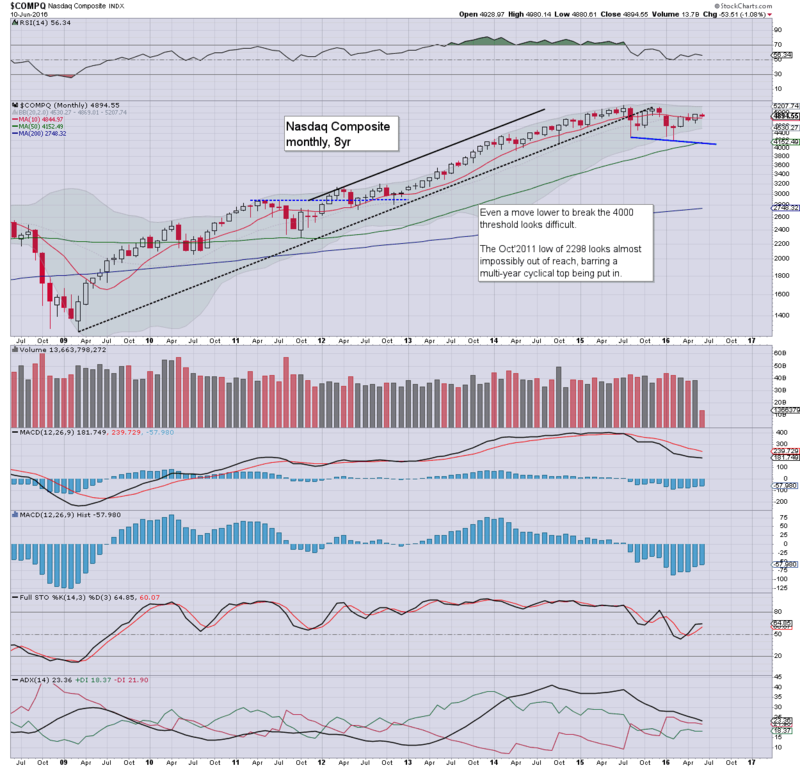 A break to the 17200/100s, will open up 16400/300s by end June. 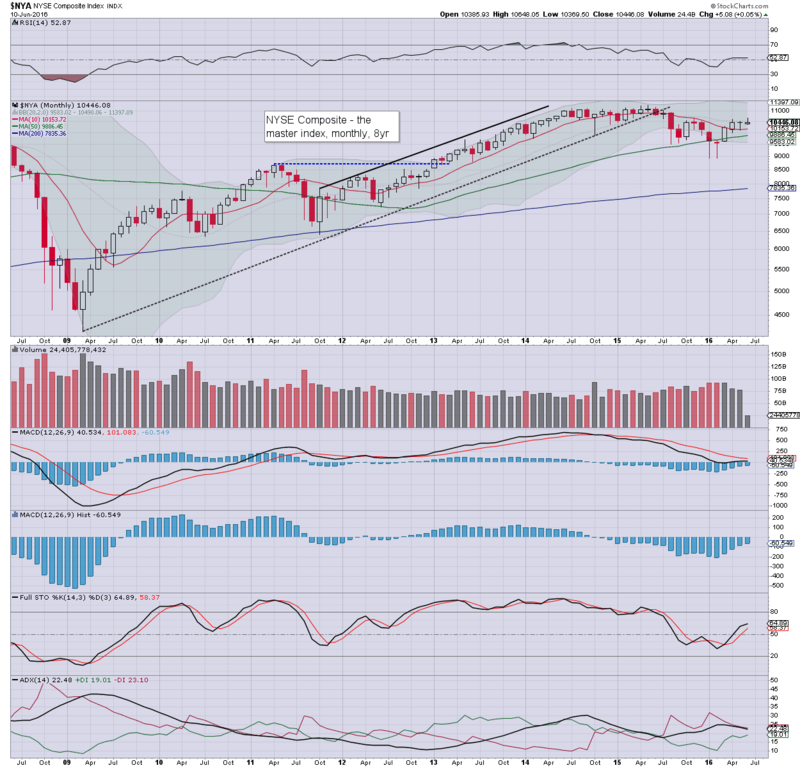 If the market closes June weak, a valid target for late July/August will be the Aug'2015 low of 15370. Below that... the 12500/400 zone. 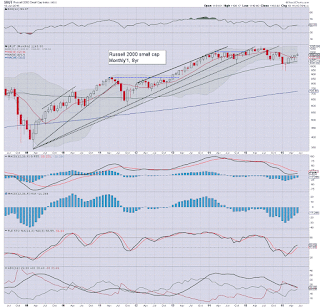 The master index is currently flat for June... in the 10400s. 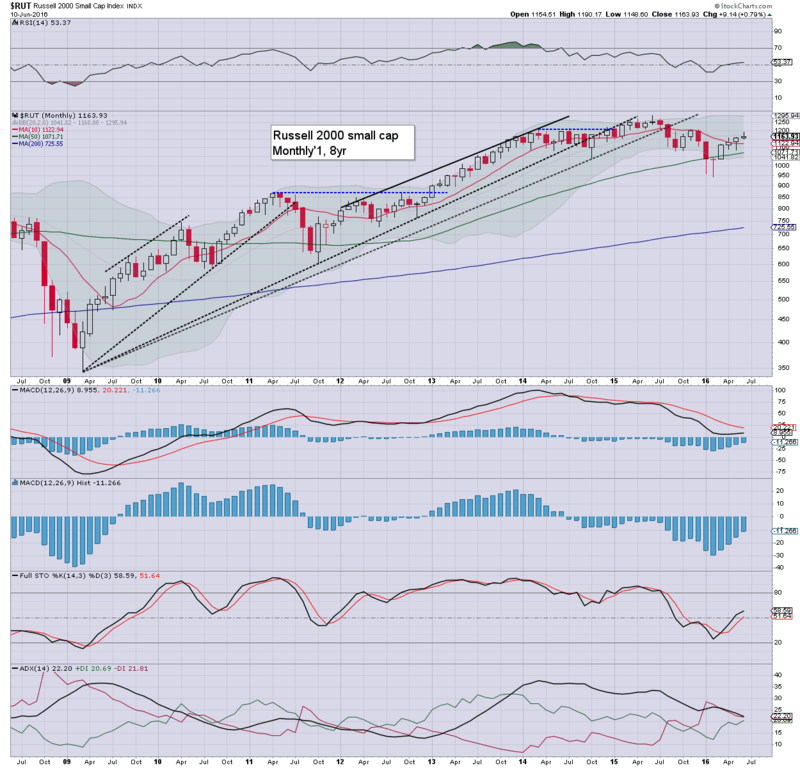 A break under 10K would be a serious warning to the equity bulls that they have failed again, with increasing weakness across the summer/autumn. After the 10K threshold, next downside target is 8K, which is a clear 20% lower. 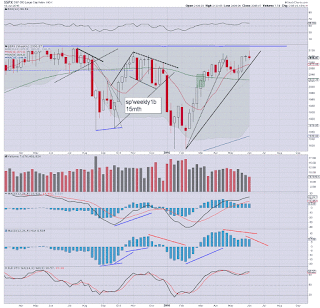 The second market leader - R2K, has become stuck in the 1180/1200 resistance zone, settling the week at 1163. 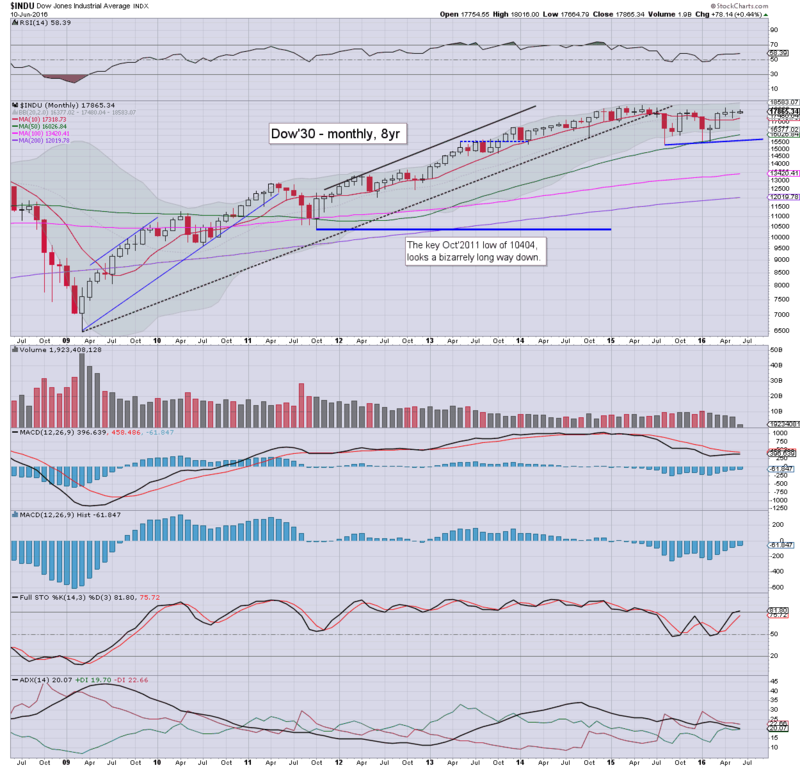 A break back under 1100 would be decisive, and open the door to the 800s later this summer. 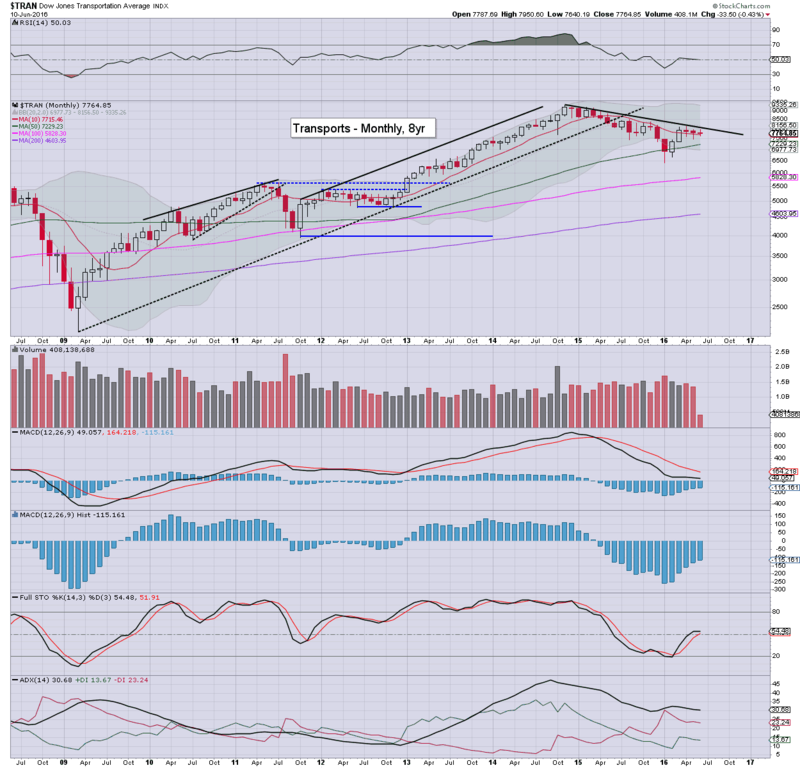 The 'old leader' - Transports, is currently net lower for a third consecutive month, holding within a broad downward trend that stretches all the way back to the Nov' 2014 high of 9310. First soft support is the 7K threshold. After that... 6000/5500. Things would only become bullish on a June/July close >8K. The bigger picture remains extremely borderline... for bulls and bears alike. 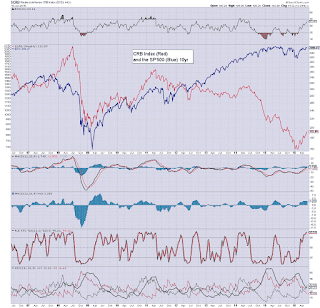 Equity bull maniacs are still unable to clear the summer 2015 highs, as there are a truckload of problems, such as weak earnings, growth/production, and an array of simmering geo-political issues. Meanwhile, equity bears have been largely ground out of the market, after a monstrous 310pt (17%) climb from sp'1810 to 2120. Relative to other world markets, the US is the most resilient, but as we saw in Aug'2015, and more recently in Jan/Feb, even the US market is experiencing occasional spells of rather powerful downside. Best guess: considering weak earnings/growth, and the price structure of most other world equity markets, I remain inclined to see another powerful equity wave lower. 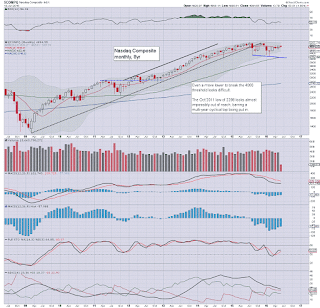 It is highly notable that the monthly bollinger bands for most equity indexes are extremely tight... a big move is due. We have a short term low of the DXY 91s, having recently been in the 95s. If geo-political turmoil results from a UK vote to leave the EU, then we're going to see a fast move to the 97/98s. 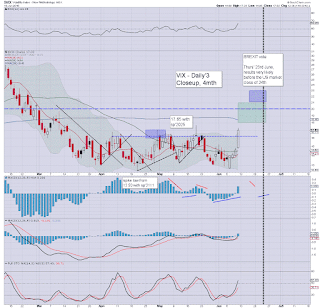 It should be clear, any weekly/monthly close above the giant DXY 100 threshold would put a massive amount of downward pressure on most dollar denominated asset classes... especially equities and oil. The one notable exception would be Gold/Silver (and the related mining stocks). Above the 100 threshold, the next key area is not until around 120, which is around 26% above current levels. A 'leave' UK vote (June 23rd) would have profound implications in FOREX land, with secondary bearish effects in equities/commodities.The mid/low sp'1900s look highly probable if the UK vote to leave. As for interest rates... there is little opportunity for a June hike. 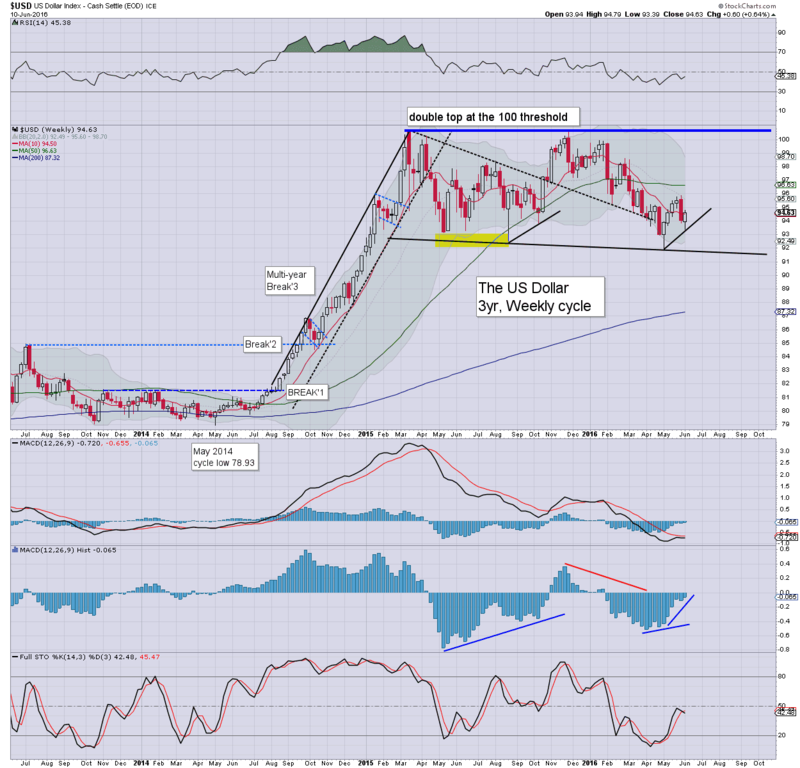 If the USD strengthens on the back of a weaker Pound/Euro, then neither will the Fed raise in July.. as higher rates would merely worsen the situation (from their perspective). Most notable is that the CRB broke well below the Feb'2009 low of 200, with a Jan'2016 low of 154. 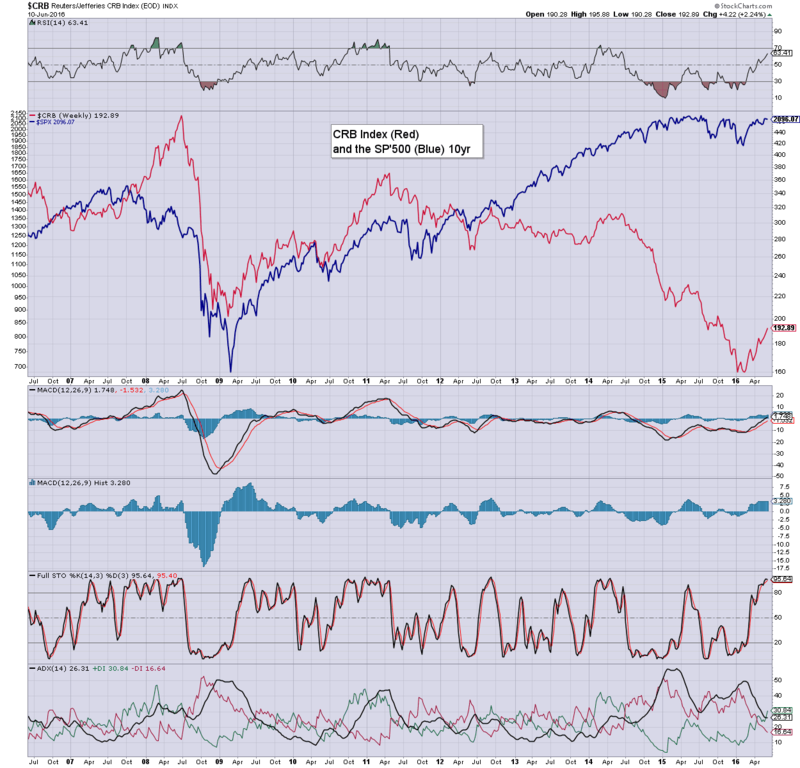 The CRB has since rallied - along with equities, to the 190s. There will be very strong resistance around 200. 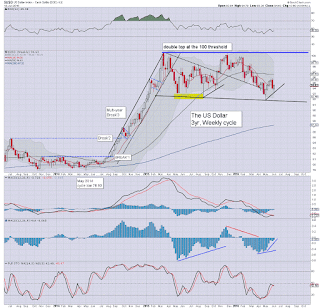 If the USD eventually breaks above the DXY 100 threshold - as seems likely, commodities will resume lower, and take equities with them. *The FOMC will announce at 2pm, with a Yellen press conf' around 2.30pm, which will last around an hour. 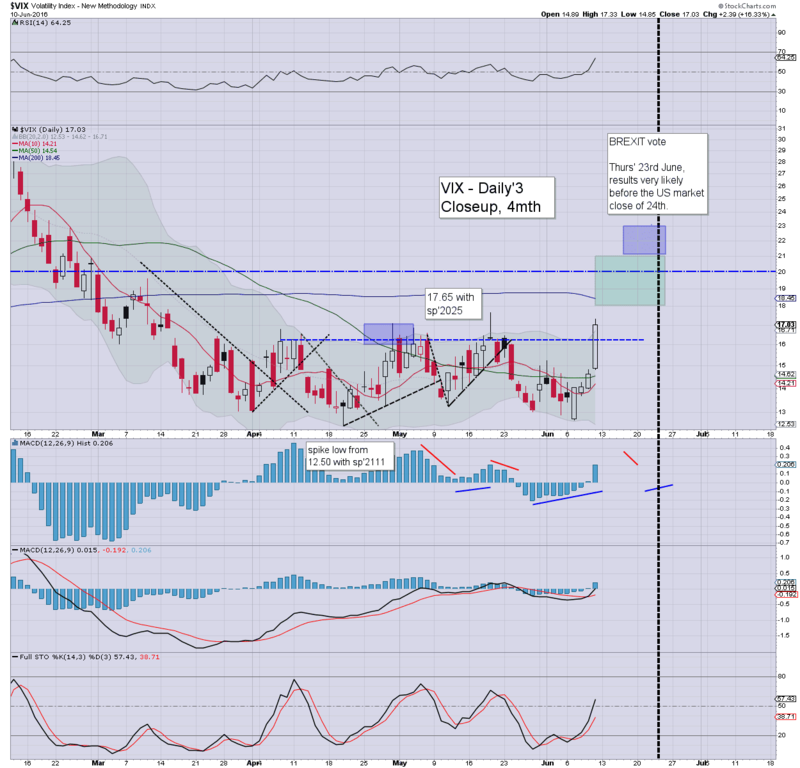 If you have valued my work since 2012, support me via a subscription, which will give you access to my intraday posts. *the next post on this page will be 7pm EST on Monday. Equity bulls managed a new multi-year high of sp'2120.55 on Wednesday, but there has since been a distinct change in market mood, with a Friday decline of -19pts ( 0.9%) at 2096. VIX is reflecting some increasing mainstream concern ahead of the FOMC (June 15th) and BREXIT (June 23rd) vote, settling +16.3% @ 17.03. Clearly, not massive declines to end the week, but somewhat significant. Market remains stuck under the May 2015 highs. Earnings, growth/production data, and a number of geo-political issues continue to pin the US - and world markets, from breaking any higher. The central banks are no doubt on standby to initiate more (insane) measures... but for them to justify that, we'll need to see considerably lower index levels. It is highly arguable that the US Fed would not be able to initiate QE4, unless sp'1600s.. or lower. Of course, talk of NIRP and QE would begin from the sp'1900/1800s. 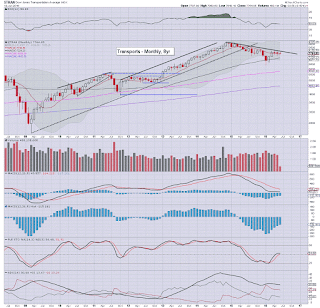 A net weekly decline (if fractional), with a spiky top candle, which is suggestive of a short/mid term high. As anticipated, we have a divergent lower MACD cycle high. At the current rate, we'll see a bearish cross in BREXIT week, with increasing weakness into early July. 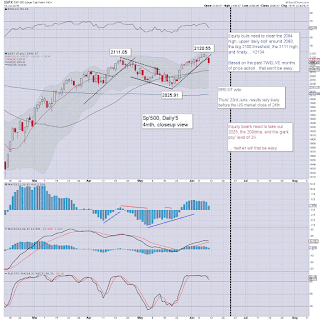 *the weekend post will appear Sat' 12pm EST, and will detail the US monthly indexes.